The 11 Best Places to Celebrate St. Patrick’s Day in Wisconsin! This Irish community in Wisconsin is vast. There are deeply-rooted Irish traditions in the Badger State, and many of those traditions are still carried out today. One way to celebrate all things Irish is on St. Patrick’s Day, and Wisconsin sure knows how to do it authentically. With tons of festivities all throughout the month of March, you won’t want to miss any of it. Here are the 11 best places to celebrate St. Paddy’s Day in Wisconsin. Even if you aren't of the religious sort, viewing the historic St. Patrick's Church on Washington Street tops off a great St. Paddy's Day celebration in Milwaukee. The building itself dates back to 1876, and as you can imagine the interior as well as exterior of the church is immaculate. Madison's St. Patrick's Day Parade is another fun event to experience if you are in the area. Put your green on, pack your lawn chair, and enjoy the parade around our state's capitol. There are so many events throughout the parade from raffles to candy collecting. After the parade in Madison, head over to Erin’s Snug Irish Pub. Authentic Irish and American dishes are served all the time but taste extra special on St. Patrick’s Day. Get a classic green beer or choose from their Irish beers. The Brocach Irish Pub offers an upscale Irish vibe. Fun and friendly service, 20 beers on draught, and over 10 years of service make coming back to Brocach an easy decision. Additionally, the Irish and Scottish whiskeys and live traditional music make Brocach Pub the perfect place to spend your St. Patrick’s Day. End your Milwaukee St. Patrick’s Day celebrations by crashing at the County Clare Irish Inn. This beautiful boutique hotel is perfect for channeling your inner Irish genes. Their warm, Irish hospitality will have you bragging about your stay weeks after your slumber. Gaelic Storm is a multi-national Celtic band. They absolutely rock the house during their performances. While they travel all over the nation, they end up in Wisconsin every year right around St. Patrick’s Day. If you love music, love St. Paddy’s Day, and love the atmosphere—you must check out Gaelic Storm. Paddy’s Pub is a festive bar in Milwaukee featuring an ornate interior featuring antiques, stain glass, and an overall lively atmosphere. Live music and a patio allow for their patrons to really enjoy the experience together. The Post Parade Party has an extensive line up of different entertainment options throughout the day. From bag pipe players, bands, singers, performances, dancers, to organ players—the day continues. There are even fun Leprechaun stories for the kids! Martin O’Grady’s Irish Pub in Madison, Wisconsin, offers a relaxing environment to enjoy the festivities of St. Patrick’s Day. Join in their nightly Irish Fest—good food and even better drink deals to help you save a little money throughout the day. 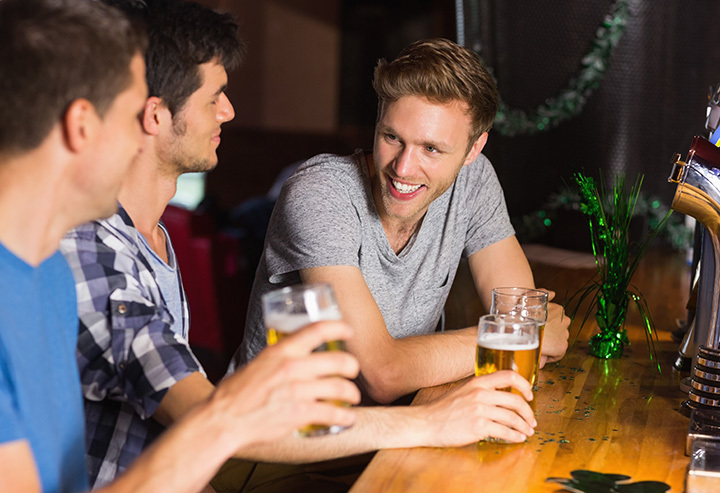 Bring the friends and kick back at Martin O’Grady’s. Downtown La Crosse’s hidden gem happens to be Dublin Irish Pub. Their authentic pub has outstanding traditional Irish food featuring lots of flavor and high quality ingredients. Tip a few green beers back while enjoying the holiday at Dublin Square.